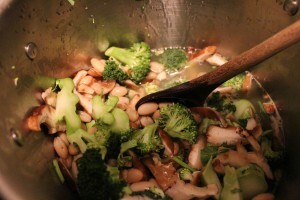 A delicious, easy, and healthful vegan lunch or dinner soup with broccoli, mushrooms, and beans! Mix the "cream" ingredients in a Vitamix or high-speed blender. Set aside. Bring to high heat, then simmer for 15 minutes or so, until the broccoli is cooked but not overcooked. Broccoli is perfectly cooked when it turns bright green and has a slight crunch to it. Add the blended "cream" to the soup pot and stir. You can either serve as is, or blend some of the soup to give it a creamier consistency. If you have a stick blender, it's easiest to blend the soup in place; otherwise, you can put portions of the soup back into the blender to make the soup creamy. Delicious Vegan Broccoli Shitake Mushroom Soup – Great for Lunch or Dinner! NOTE: Here’s a link to the stick blender we use.